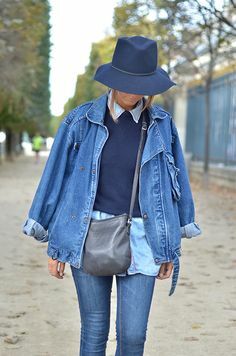 How to wear total denim? Today I was wearing a denim (Levis) shirt on (Levis) skinny jeans with leopard low boots and a flashy indigo scarf as an accent. (By the way, I want to thank Americans for creating Levis…with their different curves sizes, they are by far the jeans that fit me the best!). So, walking around the streets in this outfit I was wondering what would be this week’s post subject and thought, why not talk about the denim on denim issue? Even though every magazine is doing a subject on it is and that is all over internet, I thought I’ll share my advice on that – highly controversial – topic. As a starter, I LOVE denim on denim. As you have already guessed since I wear it. Denim has always been one of my favorite fabrics and you can tell by the outfits I choose and my recommendations. I like the roughness of the fabric that gives any item made of it some structure along with a cool cachet. Plus the older they get the better they look. Lucky jeans. Some might think it is too much. And indeed, if you do not pay attention, you can look like a cow girl… or like early 2000’s Britney and Justin. Which is kind of the same. Cow girl hitting the red carpet with diamonds. At that point, some might think that the jeans are not a very parisian thing and that denim on denim are even less. That might have been true decades ago, but today, well cut jeans have become a parisian wardrobe staple. Why? They look cool and effortless. And the parisian’s dream is to look cool and effortless. N’est ce pas Jane? 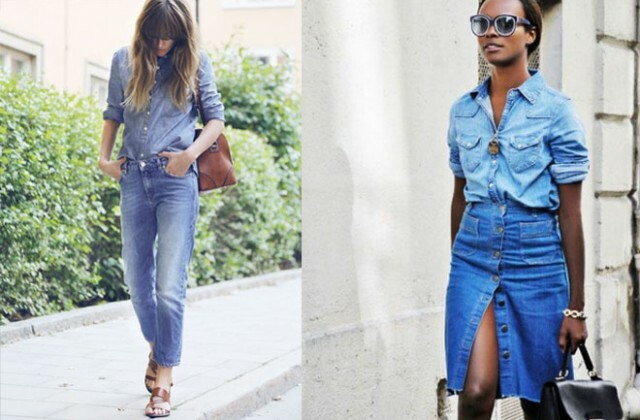 Here are my tips to look as fab as her in double denim. First, choose good quality denim. No good look will result a mix of stretchy legging looking jeans with smooth fabric. They are the perfect top for that style. 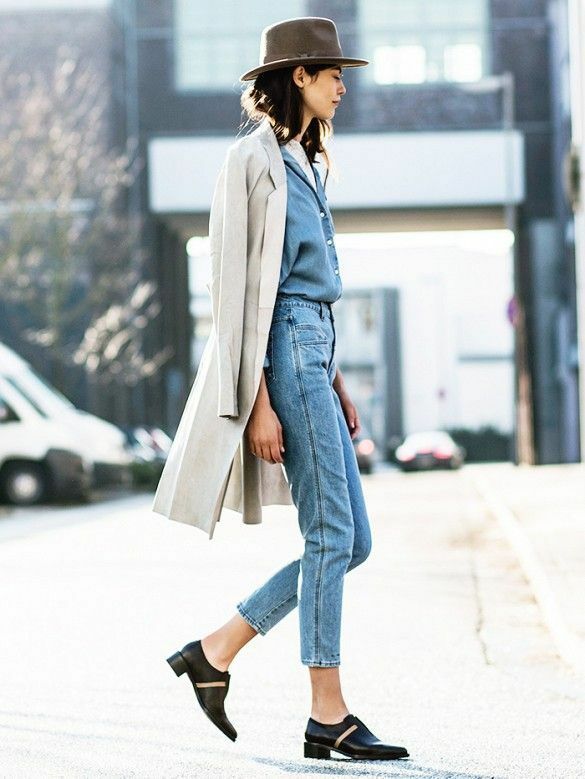 Jean tops or jackets are often stiff and they may end up making you look bulky. To make it even easier, choose your shirt in thin denim so that its fluidity contrast with the stiffness or/ and tightness of the denim pants. Roll your sleeves to show your wrists (shorts sleeves are an option too). You can also unbutton a bit to show some decolletage. Or button to the top as a statement. Because denim fabric is thick, some fit will help create a feminine allure. Of course flare fitted jeans are included. If you go for denim shorts or short skirts, they do not need to be fitted as you show legs already. Usually the shirt’s shade is lighter than the pants , but I see no reason why not to do the opposite. Tan is always a nice complement as you can see in the above pic (so is therefore leopard). Go for the jacket only if you are sure it does not make you look too bulky. Better on slender girls with narrow shoulders. The trick of breaking the color uniformity with accessories as the lady above works. The design shall remain minimalist. No jean flounce, no strass. Jean is tough. Not bling. 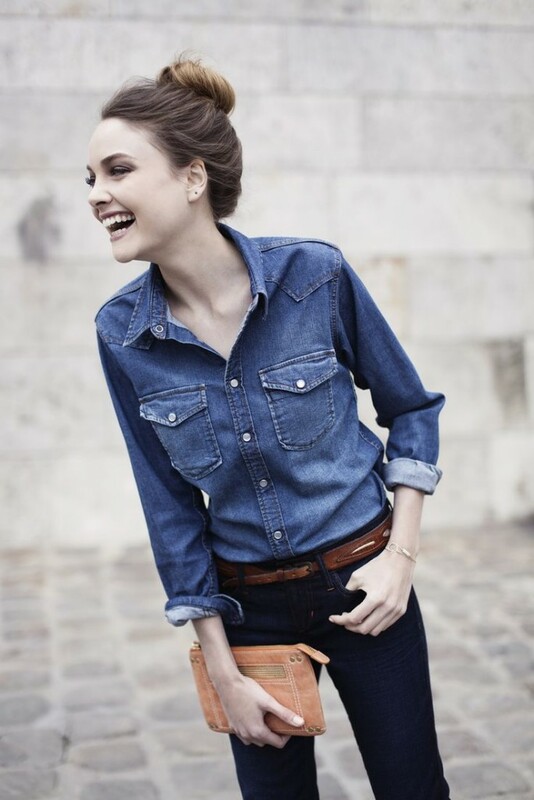 Love that denim shirt with two shades of denim. Beware, they can make a double denim look appear bulky. So you can show ankle, wrist, add heels (be tall) if you want to rock this style. Double denim is very casual so it is great to hang out in the week-ends. Unless there is no dresscode at all at your job (like at mine, bonus side of beeing your own boss ^^). If worn with high heels and red lips it can even be a style for a night out. I think it can be worn at every age. And you? Do you like denim on denim? Do you wear it? PS: could not find the images credits this week. If you know I am interested. Hi, how do I recognise quality denim? Thanks. Waow, that is a wide subject. I think I’ll do a whole post on that actually. Thanks for the great tips as always. love your blog. 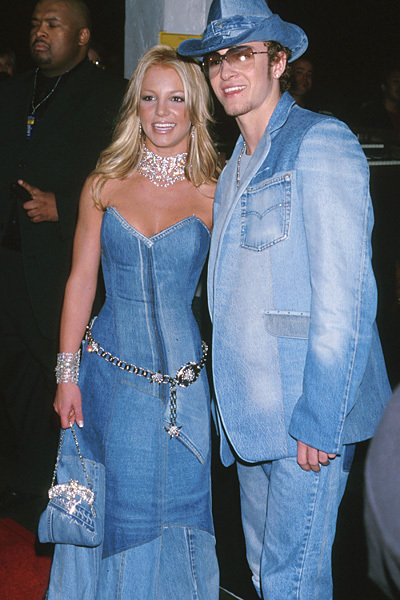 I am also a big denim fan. You might find it amusing that some in the states call wearing all denim a “Texas Tuxedo”! Hihi “texas tuxedo” love it!